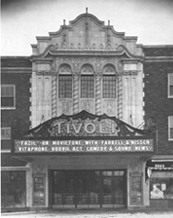 The Tivoli Theatre, located in downtown Downers Grove, was the first Classic Cinemas theatre. The theatre pre-dates Classic Cinemas by 50 years, having opened on Christmas Day 1928 as one of the first theatres in the country built to show “talkies.” Sound continues to be a major focus today, and the Tivoli has 7.1 Digital sound and an HPS4000 sound system with the acoustic power of 15 symphony orchestras. Local businessmen, Gustave and George Bunge, built the Tivoli Building, located at the corner of Warren and Highland avenues in downtown Downers Grove, in 1928 . The architects were Van Gunten and Van Gunten of Chicago. The contractor was a local firm, J.T. Schless Company of Downers Grove. The building occupies nearly 1/2 block just north of the Downers Grove train station and consists of the movie theatre, a bowling center and game room, a residential hotel, stores and offices. When the Tivoli Theatre opened on Christmas Day in 1928, there were 4,000 people lined up all the way down the block. Admission at the time was 15 cents for children and 40 cents for adults. On holidays and Sundays the adult admission was 50 cents. Originally decorated in red and gold, the French Renaissance-style theatre had a spacious auditorium with 1390 seats on one floor; there never was a balcony. The seats had red and gold horsehair upholstery. 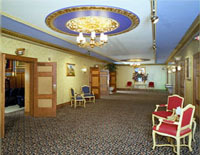 The foyer, aisles and ladies rest room required 1,500 yards of carpeting. In the auditorium, there also was a 2 manual 6 rank Wurlitzer pipe organ, but it was removed in the 1930s. The 19-foot stage is shallow, but was suitable for vaudeville and smaller productions. It is reported that cooking shows were performed on stage to demonstrate new stoves during the 1950s, but little else is known about earlier stage performances. In the mid-50's new wider seats were installed with more distance between rows for greater comfort and overall seating was reduced to its present 1,012. In 1976 Willis Johnson purchased the property and began a long-term renovation of the entire building. In 1978 the film exhibition company that leased the theatre left abruptly. 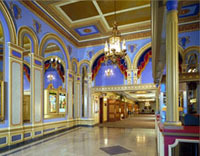 Ultimately, the Johnsons began to operate the theatre themselves and have carefully renovated the theatre to maintain its historic ambiance while adding features that modern audiences expect. In 1980 the screen was moved back behind the proscenium arch to allow live entertainment to appear on the stage. 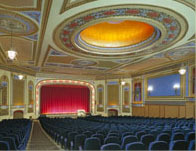 A 2 manual 7 rank Barton organ from the Rialto theatre in Champaign, Illinois was installed. The sound system was upgraded to HPS 4000 Dolby Digital Surround Sound. Four of the original dressing rooms beneath the stage area were restored in 1991, and an additional area below the orchestra pit now serves as a large dressing room for groups of 12 or more. The Chicago Area Theatre Organ Enthusiasts (CATOE) installed a 3 manual 10 rank Wurlitzer theatre organ. Occasional organ programs are conducted by CATOE. The Barton organ was moved to Classic Cinemas York Theatre in Elmhurst. 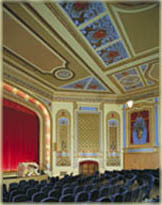 In 1996 painters Gary and Eric Reynolds spent eight months repainting all the decorative elements in the auditorium. As a part of the project, special gold leaf paint, costing $100 a gallon, was used. The redecoration created a new color scheme of blue and gold to highlight the auditorium’s many decorative elements and to return to its original French Renaissance style. On July 12, 2001 the Tivoli obtained a special entertainment liquor license so it can serve alcohol for special events. In 2002 another ambitious renovation project began. The first phase saw the installation of new larger and accessible restrooms on the lobby level. The second phase was a project to install new carpeting, which was completed early despite the size and complexity of the project. This included pouring a new concrete floor, installing a total of 824 yards of carpet and placing new aisle lights. In late 2002 and continuing into 2003, the third phase began. It includes a refurbishment of the outer foyer and concession lobby. This was followed by a complete re-seating of the auditorium with new seats featuring fold up arm rests with cup holders. 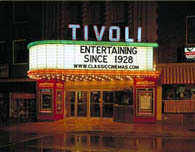 In 2003 Classic Cinemas celebrated the 75th anniversary of Tivoli Building, which makes the Tivoli Theatre one of the longest-running, continually operating movie theatres in the Chicago area. In late 2006, construction of a new state-of-the-art sound system was completed. It was designed to enhance the sound of live performances held at the theatre. This professional level sound system, ideally located in the back of the auditorium for proper sound mixing, allows for more complex sound productions with up to 48 channels of mixed sound. Today the theatre shows recent films at a bargain price seven days a week with matinees on weekends and school holidays. Several performing arts groups also use the Tivoli for their main venue. One of these groups is the West Towns Chorus. The After Hours Film Society also makes its home at the Tivoli, showing an art or foreign film on the second and fourth Monday of each month. 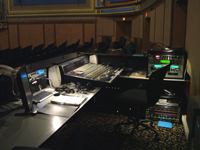 Stage services for these special events/shows are provided by members of the Tivoli Stage Crew, skilled technicians who support the Tivoli Theatre and the performing arts in Downers Grove. More information on events at the Tivoli can be found on the theatre’s special events page. In 2009 Digital 3D was installed! 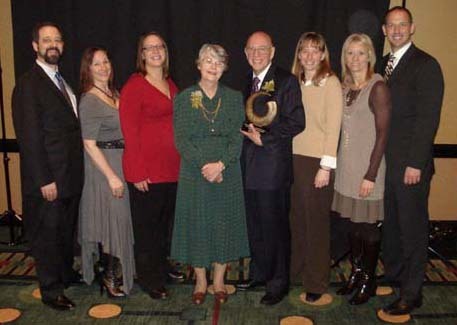 The Downers Grove Area Chamber of Commerce and Industry honored Willis and Shirley Johnson with the Life Time Achievement Award on Wednesday, March 10, 2010. Joining the Johnsons at the Downers Grove 2010 Chamber Choice Awards event were some of their children: Steve and Heidi Johnson (from left to right in picture), Amy Balicki, Shirley and Willis Johnson, Wendy Leick and Sue and Chris Johnson. On March 12, 2012 the auditorium was updated with Enhanced 4K Digital Projection and 7.1 Sound. In April 2015 the stage was converted to a thrust configuration extending over the orchestra pit making the stage depth 38 inches. Take a "Virtual Tour" of the Tivoli Theatre or view additional Tivoli Theatre History (link will open a new browser window).